Ice in the Arctic environment consists of shorefast “fast” ice and floating or “pack ice”. 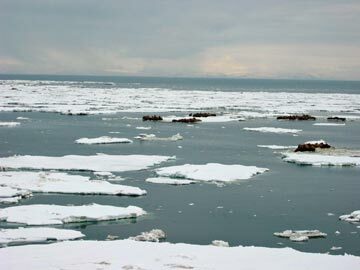 Pack ice persists year round in the Arctic while fast ice forms each winter and melts during the short arctic summer. All sea ice is dynamic and mobile, subject to dispersal by winds and currents and open water may persist year round. Nine species of animals are strongly associated with the ice pack in Alaska and some, such as polar bears and ringed seals, depend on the ice year round. Climate change is threatening the Sea Ice associated ecosystem.